Busy, busy day today, but I did have time to look at some band stuff. It was kind of a hodge-podge folder, full of pictures that span almost the entire history of bands at Rice. There’s a lot of unusual material to share. But first, here’s something to just give you some of the flavor of my job. This is a remarkably expressive photo. Everyone is reacting as if the guy at the front right either just said something outrageous or violently broke wind. 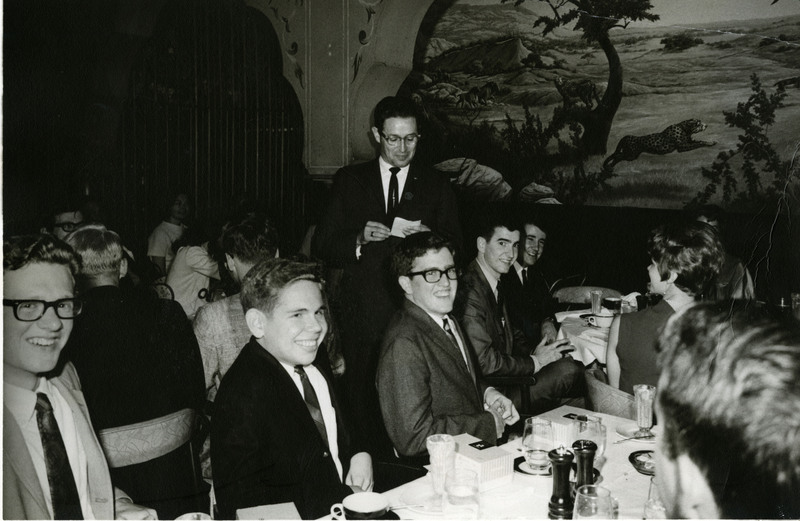 Top photo: Left corner (foreground) may be Chuck Prokop; to his left is Charles Aarni (whom I saw at the Centennial. He got a 5-year bachelors and masters degree in chemical engineering in 1972). Bottom photo: (l-r): Charles Aarni, Tom Reveley, (? ), Dawn Pennington, (first name?) Barrington (oboe player), Donna Misner (Collins), (? ), (? ), (?). I like the viewpoint for the second photo. If there wasn’t a staircase, this was shot standing on a table and maybe with the camera over their head. Rodchenko-style. 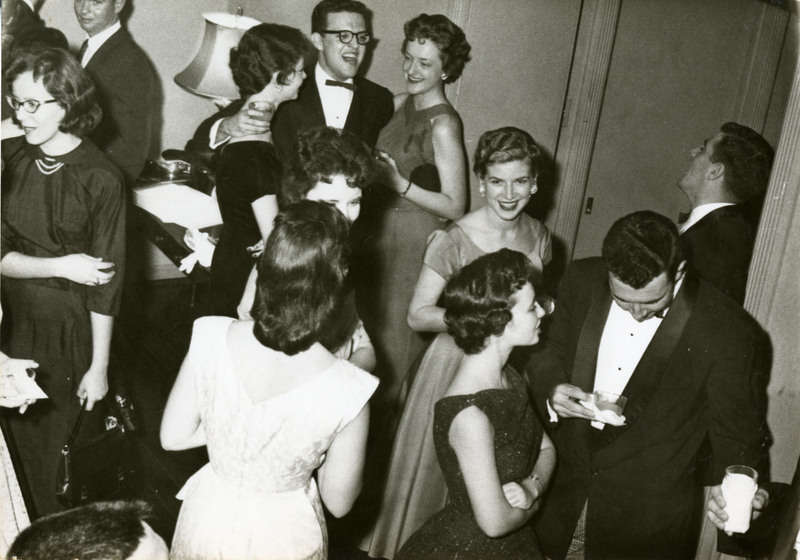 Normally, I’d date a photo by the women’s fashions, but the dresses are tending towards classic and that super-thin bow tie is pretty mod. Add: Charles Aarni came to Rice in fall 1967, which was also Bert Roth’s first year as director of the Rice Band (soon to be The MOB). So the top and bottom photos were taken not taken earlier than Fall 1967. The middle one looks older to me. Bert Roth and Tom Reveley look so young that I barely recognize them. In photo 3, left-hand-side, I see someone carrying what looks like a tray, so maybe he is a waiter. He is wearing a white tunic, a black belt and what looks like a turban with a fabric fall down the back? The decor looks pseudo-Moorish or pseudo-Egyptian (in a 50’s kind of way). The girls’ shoes (flats with large buckles) and the white dress look very much like 1967. Based on the women’s fashions, I agree the middle picture is older. The short curled hair, wide necklines and clip earrings say sometime like 1961-62 to me. (Very Jackie Kennedy style). Did you notice the hand on the right holding a glass of milk? I notice one of the girls in your smooth operator’s arms has a wet left shoulder. Do you think they three just hugged and he spilled his drink on her dress? You know what is most surprising about these photos? No one is smoking! I think the “milk” is a napkin wrapped around a glass. But I agree about the fashions — all those looks are classic now. And about the smoking, too. Notice the white gloves on the table in the background of the second photo? The dresses in the last picture are clearly later. The pale “bag” dress is a totally different idea than the dresses in the middle picture. Plus, the guys have gone from tuxes to wearing a print shirt with a sportcoat. I don’t know the people, but I do recognise the restaurant in picture #1, It was located on S. Main, south of where it crosses I610 today. I cannot exactly remember the name, but it was something like the Polynesian Room or the Polynesian palace. As I recall, they were famous for their Peiking Duck, although that might not be quite right. I cannot remember what year it vanished, and I think we (my family) only ate there once, although I think my parents may have returned without my sister and I. Sometimes my memory is not so great. As I looked unsuccessfully for further info, it occurs to me the name of the restaurant was Polynesian Gardens. 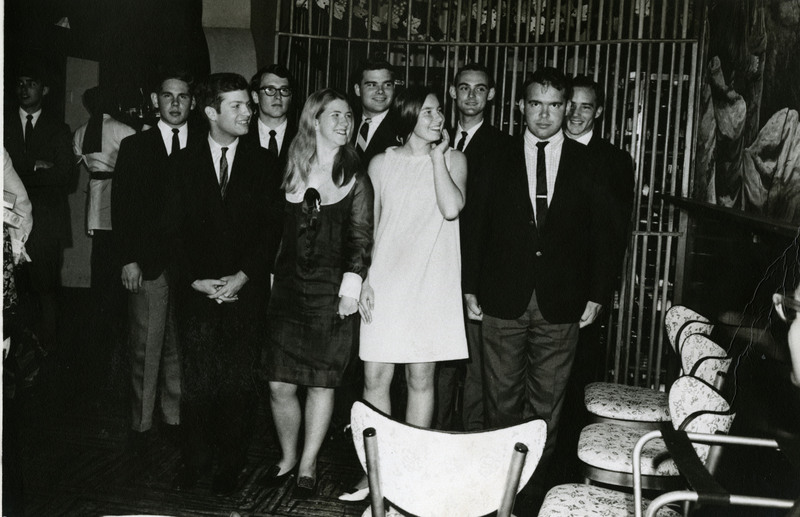 The top and bottom pictures were taken at a place on Richmond near the loop that had a safari theme (name currently unknown) at the 1969 spring band banquet. Mike Ross has many of the folks in the bottom picture identified l to r – Charlie Aarni, Tom Revely, ?, Dawn Pennington, John Barrington, Donna Misner, Norman ?, David Ammerman (also known as “”The Aggie”), and Chris Colvert. David transferred from A&M after his freshman year to participate in NROTC and he could put on a “Corps” face that would – as is obvious, break us up. Could that have been the Safari Room? I was first thinking Harry’s Kenya but that’s not it. The expressions on the faces of the nearby women belie the “violently breaking wind” interpretation. They look far too happy. Or, more simply, Trader Vic’s? There are other pictures from “before my time” showing Bert smoking a pipe. I never witnessed that myself, in the 28 years that I knew him. There were also no banquets from ’73 until they were revived after the ’81 football season, and then they were held on-campus. Definitely late 60’s, not early. (And since I was at Rice in the late 60’s, I can’t help but think of THAT as the better part of that decade 😎 ). A couple of the kids in the bottom photo look familiar but I can’t put names to them. Kathy – I was able to name all of them except one in the bottom photo – above in the comments.